Marriage is a public declaration of love and commitment between two people, but it is also much more; it’s a legal and an economic relationship. A prenuptial agreement is a formal legal and financial document that prospective marriage partners draft and agree upon prior to their marriage. The process of drafting a “prenup” is an exercise in thoughtful planning that should bring benefits and protections to both partners in the upcoming marriage. In southern California, an experienced Orange County prenuptial agreement lawyer with the Bayati Law Group can help prospective marriage partners draft a sound and equitable prenuptial agreement and can also help both parties fully understand the agreement’s terms. It may sound anti-romantic, but a “pre-nup” really can save everyone involved from a great deal of aggravation and inconvenience in the event of a divorce. Prenuptial agreements, legally called “premarital agreements” in California, go into effect at the moment of marriage. Formal premarital agreements are written, agreed to, and signed by both parties prior to the marriage, while postnuptial agreements are decided upon after the couple has already legally married. Both parties have the right to obtain legal advice from a prenuptial agreement attorney regarding the agreement before signing. An experienced Orange County family law attorney with the Bayati Law Group can help you to create the agreement that protects both you and your spouse as well as your long-term interests. Premarital agreements are not set in stone–a modification can be made at any time at the couple’s request. After the wedding, a premarital agreement may be redrafted, amended, or even cancelled entirely if both spouses agree to the change in writing. The Bayati Law Group reviews existing before marriage agreements to make sure that those agreements are legal, fair, and appropriate for both partners. If you need to have a before marriage settlement drafted or reviewed, or if you have any concerns or questions about your own prenuptial agreement, promptly arrange to speak with an experienced California family law attorney at the Bayati Law Group. WHAT DOES A PRENUPTIAL AGREEMENT ACCOMPLISH? The purpose and aim of a formal prenuptial agreement is to resolve in advance a number of potential conflicts, including the division of assets, finances, children, inheritances, and other typically contentious matters likely to surface if the marriage ends in a divorce. Prenuptial agreements are quite practical for many couples. A formal prenuptial agreement lets both spouses protect their individual property if they wish. A prenuptial agreement can also protect both spouses from the other’s debts, and it can precisely spell out the support one spouse will provide to the other in case of a death or a divorce. In the state of California, a prenuptial agreement is legally valid only if both marriage partners voluntarily agree to it after a complete disclosure of all assets and debts. The partners must be represented by separate attorneys or at least have a reasonable opportunity to seek legal advice prior to signing. Seek that advice from the Bayati Law Group. We can review your prenuptial agreement and provide the insights and advice you need to avoid marital disputes over property division, child custody, visitation, and other issues. A prenuptial agreement in California cannot disregard the right of a child to future child support from either parent. Spousal support, however, can be limited or waived if both parties agree. Prenuptial agreements can potentially address a number of issues such as property rights, life insurance benefits, the fate of the family’s pets, and virtually any other matter of real concern to one or both partners. Divorce is never part of the plan or one of your end goals when you’re getting married. It’s understandable that a prenuptial agreement can be a rather awkward topic for an engaged or a newlywed couple, since a prenuptial agreement directly addresses the potential dissolution of the marriage. Nevertheless, a fair agreement that has the consent of both partners can offer the protections, benefits, and advantages that both partners may need if in fact the marriage does end in divorce. Let an experienced California family law attorney at the Bayati Law Group help you and your partner draft the prenuptial agreement that provides both of you with the maximum legal protection. CAN A PRENUPTIAL AGREEMENT BE SET ASIDE? Inevitably, when one or both partners make the choice to divorce, a prenuptial agreement will be challenged. If a prenuptial agreement gives one partner less than that partner would have received without the prenuptial agreement in place, that spouse may choose to challenge the prenuptial agreement and attempt to have a court set it aside. California divorce courts are committed to fairness, so when a divorcing spouse challenges a prenuptial agreement, a judge will first determine if the agreement is unfair compared against what the court would do without the agreement in place. When there is a substantial difference between what the court would do with and without the existence of the prenuptial agreement, then a California judge may decide that the prenuptial agreement is unfair and thus is unenforceable. The court may then find cause to consider the original circumstances of the prenuptial agreement. Was any fraud or duress involved to force one spouse to enter the agreement? Did both partners fully disclose their finances prior to signing the agreement? When a divorcing spouse challenges a prenuptial agreement, a California court will typically conduct a thorough investigation into the situation. At this point, you will need an attorney who has experience dealing with prenuptial agreement litigation to ensure you achieve the outcome you desire. 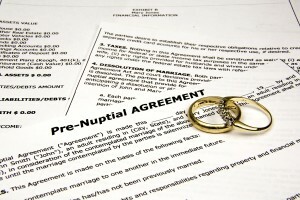 In fact, under California’s Uniform Premarital Agreement Act, prenuptial agreements that have been made since 2002 may be enforced only if a spouse received complete information about the other spouse’s property, business, and finances prior to signing the before marriage settlement, had at least seven days between first receiving the agreement and signing it, and was represented by legal counsel when signing the accord, unless the spouse signed a separate document voluntarily and expressly waiving the right to an attorney. You can schedule an appointment right now to consult with an experienced Orange County prenuptial agreement lawyer at the Bayati Law Group regarding a prenuptial agreement or any other matter of family law by calling (949) 798-5700 or by completing the form on the contact page of this site. This contact page also contains driving directions and a map with information on the location of our office. Every Bayati Law Group client and prospective client is treated with complete respect and is extended every possible professional courtesy. Every client phone call and email is returned promptly. Nothing is more important than your future. If you are going to be married in southern California, schedule a consultation as soon possible with an experienced Orange County family law attorney to learn more about the advantages and benefits of prenuptial agreements. The lawyers at the Bayati Law Group represents clients in all matters pertaining to family law in Orange County and throughout southern California.